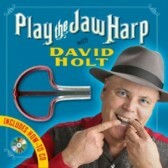 The Jaw Harp is also called a Jew’s Harp, Trump and a Juice Harp. This step-by-step mini-course takes you from beginning to advanced levels. You’ll learn songs and melodies, how to make cartoon sounds, talk through it to your friends and play catchy, rhythmic tunes. You’ll also hear wonderful music performed by the world’s best jaw harp players including Mike Seeger, Fred Whitlow and John McCutcheon. Play along with them to perfect your chops! 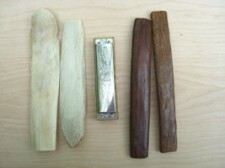 Included with this CD is a free Jubilee jaw harp made for us in Austria. This high-quality instrument is crafted from the finest spring steel, has a bright, pure tone and is easy to play. The “Bones” are rhythm instruments that go back to prehistoric times. They are special to me because the bones were the only traditional instrument passed down through my family, on the Holt side. My father and grandfather taught me to play when I was a child. (see Joe Holt in Mentors section). The pair of wooden bones on the right were made by my Great, Great, Grandfather John Oscar Holt from Alamance Co. NC in the 1860s. The ones on the left are actual cow bones I play on stage. 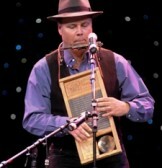 123 year old Susie Brunson from Wilmington, NC taught me how to play the washboard (See photo on next page). Susie said washboard was the only instrument they had in the black community in Bamberg, SC in the 1870s. It had to be played subtly. Susie told me to just tap it lightly. She also suggested I add an old metal cup and a wood block. I have a complete lesson on the Folk Rhythms video. The stumpfiddle is an instrument I came across in Burnsville, NC. It was played in both the black and white communities. 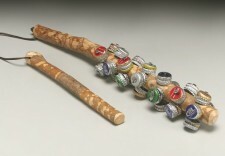 Made of bottle caps nailed to a stick it is a great rhythm instrument. You simply pound the stumpfiddle to the floor on the beat and then hit it with the smaller stick on the off beat. This simple one string bow is likely the oldest stringed instrument in the world. It is still played in the Southern Mountains today. Many old-timers simply used a stick with a string made of cat gut.